Last time we looked at the Importance of Content. In this post we will consider the value of Social Media. 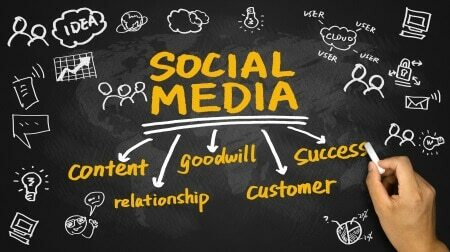 One of the most direct means of online communication with your customers, prospects and employees is Social Media. Not only that, Social Media is a key driver of content (Remember, content is King!) distribution and the online visibility of your brand. There are dozens upon dozens of social networks you can use to your advantage…far more than we could possibly look at in thins week’s blog entry. So, for the sake of time, mine and yours, we are going to focus on the “big three”: Facebook, Twitter and LinkedIn. Facebook has in the neighborhood of 1 billion monthly active users. Yep, that’s billion with a “b”! That makes Facebook THE most popular social network in the world. That also makes Facebook an extremely powerful platform for building a community of advocates for your business. Make Sure your Company Information is Complete – Be sure to include a brief but concise overview of what your business offers as well as a link to your website. Invite Existing Facebook Friends & Family to “Like” your page – Reach out to your friends, family and existing customers on Facebook and ask them to “Like” your Business Page. Share Content (Remember, Content is King! . O.K I’ll stop) – If you have created a customer avatar, (Hey I just had an idea for another blog post!) then you already have a pretty good idea of what is going to resonate with your target audience on Facebook. Make a weekly post or two that includes useful information that provides value to both your current customers as well as potential future customers. This will go a long way toward engaging and encouraging more interaction in your social network. Use Paid Facebook Advertising – Because of the way Facebook’s algorithm works, simply posting updates to your company page may not get much traction. You might try spending some of your advertising budget on targeted ads. A word of caution here though. If your objective with your Facebook ads is to drive traffic to your website, then avoid the option to “Boost” your post. “Boosting” a post only serves to optimizes your Facebook page for engagement—likes, comments, and clicks. Instead, your advertising dollar is better spent on paid targeted ads where you can assign the objective of the ad to specifically increase website traffic. Twitter is the social network that encourages you to get right to the point of your post. Users share 140 character messages and other users can ‘follow” another “tweeter’s posts. If you are not a celebrity or if your brand does not already have a huge household following, it is not a cakewalk to get much marketing traction on Twitter. That said, there are a couple of things you can do with Twitter that can quickly and effectively attract quality followers for your business’s Twitter account. Create and Optimize Your Twitter Profile – Write a profile that will clearly let potential followers know who you are, what you are about and give them some compelling reasons to follow you. Tweet, Tweet, and Tweet Again – The best Twitter tactic for growing your list of followers is to tweet 24/7. Tweet content you have created. Tweet content others have created. Tweet your tweets more than once! There are lot’s of scheduling tools out there like Hootsuite and ZoHo that will allow you to manage your posting frequency and enable you to Tweet while you sleep! Collect and Share Content – Use Feedly, Goodreads, Alltop, Twitter (lists), StumbleUpon, LinkedIn Pulse, and what’s hot on Pinterest and Google+ to discover great, relevant content to tweet. Add Interesting Visuals to Your Tweets – Take the time to create great visuals and add them to your tweets. It pays off in engagement, conversion, and click-through rates. To get you started, our friends at Hubspot offer 195+ visual templates you can use across all of your social media campaigns. LinkedIn is a pretty unique space on the web. It can be used to engage prospective customers as well as potential employees or outsourcing contractors for your agency or business. LinkedIn blurs the lines between knowledge sharing and relationship building. Create a Detailed Company Description – In order to make it easy for the right people to find your company page on LinkedIn, be sure to include keywords in your description and also in the ‘specialties’ sections. Focus on Visual Appeal – Keep your company page fresh with rich cover images that reflect your accomplishments and the different events. offerings and services. Share Updates Regularly – Every like, share and comment you get on your LinkedIn page increases your reach. Encourage your followers to take some sort of action with your updates by asking them thoughtful questions. Publish Long-Form Content – LinkedIn is a great platform for sharing content aimed at your Industry. Regularly posting long-form pieces will serve to build your brand’s thought-leadership in the LinkedIn community. Of Course there are other social platforms out there besides the three we just looked at. Pinterest, Instagram and Snapchat are three other social media communities with huge numbers of members. Click on those links to learn more. One more thing worth mentioning here and that is. . .
• Google Alerts – Set up multiple Google Alerts for your company, brand, products, leaders, industry terms, etc. The alerts will get delivered directly to your email inbox at the frequency you indicate (e.g. daily or as they happen) and they are a great way to track mentions of your brand and relevant keywords on the web. • Social media management tools – These tools allow you to save keyword searches as a live stream so you won’t miss out on what’s being said about your brand, your industry, and your products. • Social Inbox – In addition to providing the social monitoring functionality of a traditional social media management tool, Hubspot provides a tool called Social Inbox that plugs into your contacts database, color codes your customers and leads, and helps you prioritize your engagement so you can focus your time on the conversations that are important to your business.